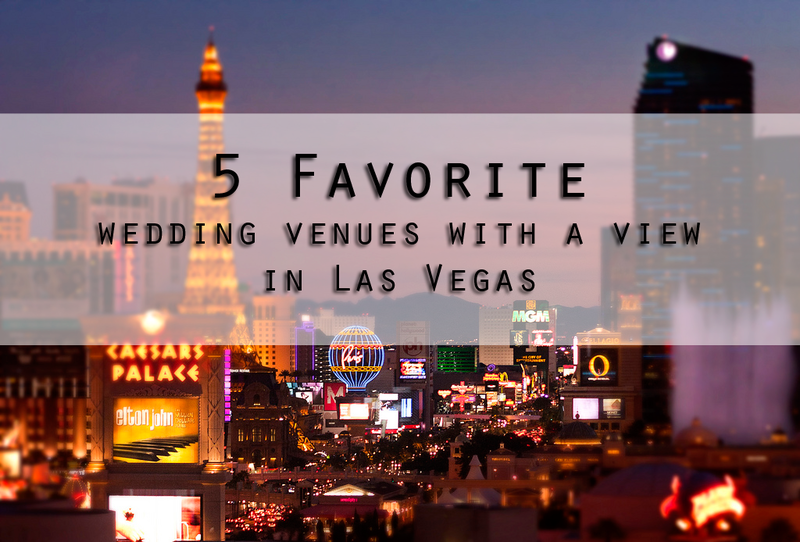 Today’s venue spotlight falls on my five favorite rooftop wedding venues in Las Vegas. 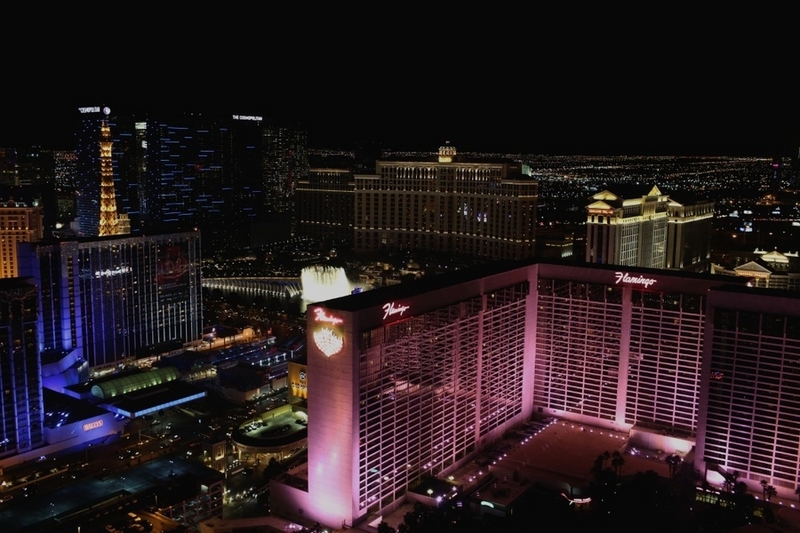 On Strip or off Strip, the city is full of amazing viewpoints with romantic sparkly lights and a birds eye view of one of the busiest streets in America. Great views from stunning heights, here are five of my favorite venues for gettin’ high at your wedding in Las Vegas. For more modern Las Vegas wedding venues, visit the Little Vegas Wedding Venue Guide. See all posts in the 5 Favorites series here and check out all the Vegas wedding venues with gorgeous views right here. This venue perched 43 floors up at the top of Mandalay Bay has an incredible view north up the Strip from one of the most southern hotels upon it. With intimate indoor venues an option, the one I like best is the Mandalay Patio with an open air view that will bring gasps to your wedding guests. (And those scared of heights to their knees, possibly.) Simply stunning. See real weddings at House of Blues/Foundation Room featured on Little Vegas Wedding. An off Strip casino and hotel, the jewel in its crown is the 16th floor ballroom/nightclub called One Six Sky Lounge perfect for private events. 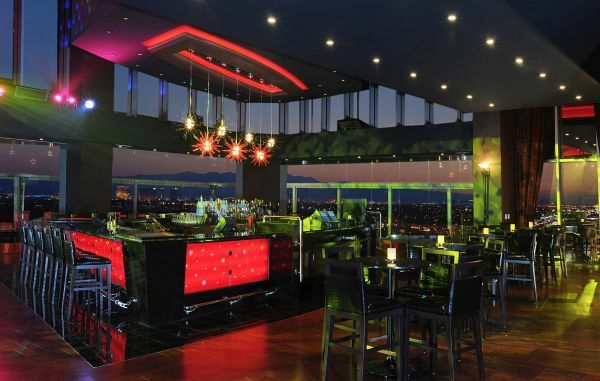 More than 300 guests can catch sweeping views of north Las Vegas and the Strip from the floor to ceiling windows and enjoy the modern lounge-like atmosphere accessed via private elevator. Another off Strip view vantage point, VooDoo Lounge at Rio Hotel and Suites offer the usual range of hotel ballrooms and amenities the VooDoo lounge, 51 stories up really shines. Your wedding ceremony can be set against a panoramic view from an open air bar looking at The Strip, but must place between 10am and 2pm, with a 75 guest maximum. Receptions are a possibility, but again, must take place during the day, as the bar is so popular at night. See more wedding venues with fabulous views here. One of the more economical choices for a wedding in Vegas, Tahiti Village is a timeshare just south of the Strip. It offers a beautiful view of the nearby airport as well as the neon and lights of the Strip in the distance. Skyview 510 is a traditional ballroom with two attached patios for up to 100 guests is on the 10th floor, so it is high…but not too high! Get more info on weddings at Tahiti Village. The newest sky-high wedding venue in Las Vegas, the supersized Ferris wheel offers quickie wedding ceremonies from one of the 28 modern observation pods. Say your I Dos from 520 feet in the sky (currently the world’s tallest observation wheel) before you come back down to Earth again. The least expensive packages start from $2145. See real weddings at the High Roller featured on Little Vegas Wedding. For more sky-high wedding venues option in Las Vegas, visit the Little Vegas Wedding Venue Guide. Or read more posts in the 5 Favorites series, including Vegas gardens, museums and more. Photos: Joseph De Palma, Mandalay Bay, Eastside Cannery, Hotels.com, Tahiti Village and Lindsay Collette Photography.